I hate to admit this, but when I first heard about the hype over this cleanser, I was really puzzled. I’ve never been particularly excited about my cleansers, and I also couldn’t really understand why people were so crazy over this. That’s also probably because I don’t expect much from my cleanser – all it has to do is wash my face well without causing me to break out, and I think I’m pretty much satisfied already. 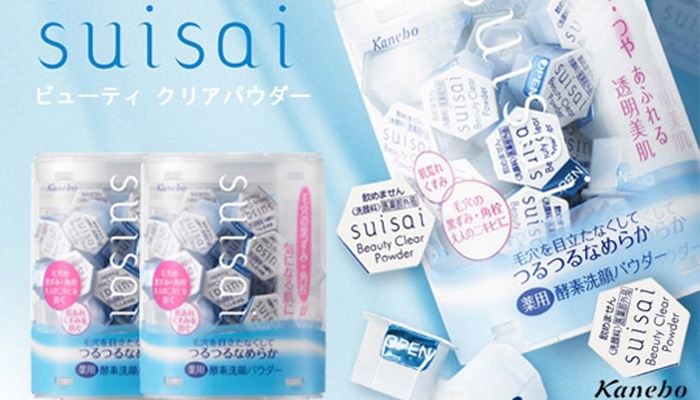 suisai Beauty Clear Powder face wash is catching the eye of the worldwide audience with an enzyme-activated formula that whisks away impurities and unclogs pores as it protects the skin’s natural moisture. A popular choice for tourists who desire the Japanese secret to even, finely textured skin. Packaging: This is probably one of the most convenient packaging I’ve ever seen for cleansers (samples not included). I was so tempted to buy lots of them to bring on all my travels because I just have to pack a few, and throw them away once I finish washing my face! It’s seriously so convenient to use as well, I don’t have to worry about squeezing out too much product or anything because there is already a fixed amount of product in each capsule. Texture: As the main ingredient is talc, it’s not surprising that this comes in a powder form. All you need to do is add some water and rub, and you will get lots of foam. I really like that it lathers ‘normally’, because I feel very insecure when my cleansers don’t produce enough foam (weird but true). Effectiveness: The first time I tried, I did kind of get why this is so popular. Don’t belittle the small amount of powder in this capsule, because it’s super effective in making sure there’s no grime, dirt, or excess sebum left on your face. My face probably has never felt so smooth and clean before – it’s miraculous! However, I don’t mean to say that it completely strips your face so that it’s squeaky clean and feels really tight (that’s terrible btw, if your cleansers do that). That being said, it is not recommended that you use this cleanser on the daily, and definitely not in the morning AND night. Why? Because it actually exfoliates your skin as well, and you know exfoliators aren’t to be used everyday, so best to use this maybe 2 or 3 times a week. I’ll be frank: this is one pricey cleanser, and do we really need pricey cleansers? Well. I do like this product, but I’m also the kind who can settle for cleansers that cost less and just do its job of making sure my face is as clean as it can get. This cleanser is also probably not suitable if you have very dry or acne-prone skin, because some of the ingredients are potential irritants (see link in Ingredient List), and it may dry your skin out even more. I’m also a little disappointed that this isn’t a cleanser that I can use everyday, morning and night. I think it’s a bit wasted, considering that it comes in such a convenient packaging.